Cover of Time, August 28, 1995. Evolutionary psychology beat out its rivals in the race to win public acceptance. During the 1990s, evolutionary psychology overtook and replaced sociobiology. Its success was total, much like that of many paradigms we now accept as normal science. Did it succeed for the same reason? Did it better fit the data? In some ways evolutionary psychology was better than its rivals and in other ways worse. Its superiority tended to be more organizational, even political. In short, it became the only game in town for study of human behavior from an evolutionary perspective. The alternatives—sociobiology and gene-culture co-evolution—had much less to offer in terms of research funding, career opportunities, or just an untroubled academic life. - To facilitate the exchange of ideas and findings among researchers in the area of Evolution, Psychology and Psychiatry. The developing new basic science will be emphasized. - To consider plans for initiating an organization that will promote research and scholarly exchange in the area of Evolution, Psychology and Psychiatry. The proceedings only hinted at evolutionary psychology’s eventual divorce from sociobiology. Some presenters talked about a mismatch between current behavior and earlier contexts of adaptation, but these contexts were not placed over a million years ago in the Pleistocene. As a result of these articles and succeeding ones, the Pleistocene EEA came to define evolutionary psychology. The latter ceased to mean ‘sociobiology for psychologists’ and took on a narrower, more paradigmatic meaning. At the turn of the 1990s, it was still far from clear that evolutionary psychology would take over from sociobiology. Gene-culture co-evolution seemed to hold a stronger position. This other paradigm began in a cultural evolution class that L.L. Cavalli-Sforza taught in 1978-79 at Stanford to Robert Boyd and Peter Richerson (Stone & Lurquin 2005, p. 108). The Italian geneticist argued that the natural environment has not been the main driving force of human evolution. Instead, this role has largely fallen to the cultural environment, such as oral and written language, social organization, technology, means of subsistence, and so forth. There has thus been a feedback loop: we humans have created different cultural environments, which in turn have subjected us to different pressures of natural selection. Our creations have become our creators. This co-evolution fascinated Cavalli-Sforza, and its study now occupied his thoughts. Work on gene-culture co-evolution initially involved trawling through the ethnographic literature. In the mid-1980s, however, a major project for field research was launched, specifically among the Inuit of northern Canada. One of the most remarkable phenomena in the contemporary Canadian Arctic is the presence of highly-acclaimed art forms — carving in stone and ivory, and printing on paper. The question we ask is: how can we account for the wide-spread distribution of such talent in a small dispersed population? […] Is it possible that artistic talent is transmitted culturally (from parents to offspring, from others in society to the artist, and from peers to artist)? How can we assess these types of transmission? The project fell through. At Laval, we assumed something went wrong with the funding. At Queen’s, the story was that Cavalli-Sforza had quit because of illness. Yet his biography makes no mention of illness during this period, the only bouts of ill health being an operation for bladder cancer in 1976 and a heart attack in 1991 (Stone & Lurquin, 2005, pp. 98, 160). In any case, ill health would have been a reason for postponing the project, not canceling it. This project has left no traces in any of Cavalli-Sforza’s publications—books, journal articles, conference proceedings, or poster sessions. The paper trail amounts to one unpublished report (Berry & Cavalli-Sforza, 1986). Just as mute are his published writings on gene-culture co-evolution. Examples are confined to the usual suspects: lactose tolerance in cattle-raising societies, and malaria resistance among tropical agriculturalists (Cavalli-Sforza & Cavalli-Sforza 2008, p. 264). There is no hint that natural selection might have favored different mental traits in different cultural environments. With Cavalli-Sforza gone, the field of gene-culture co-evolution lost momentum. It had big names, but few of them could put boots on the ground, i.e., do fieldwork. Nor could any of them focus on this area of research. As big names, they typically had their fingers in many pies. Evolutionary psychology thus beat out its rivals by default. The term ‘sociobiology’ was becoming a mark of Cain even among people interested in human behavior and evolution. In 1997, it was literally voted out of existence. Gene-culture co-evolution continued to attract interest but only as a sideline. With its rivals growing ever weaker, evolutionary psychology gained strength as the millennium drew nearer. It could now offer grad students a hassle-free research environment with a real chance of academic employment later on. This may have been due to avoidance of the stormy issue of population differences (although academia in general was becoming calmer). A bigger reason, however, was the strong focus of its main proponents, John Tooby and Leda Cosmides. They talked at conferences, gave interviews to the media, networked, and published, published, published. As they slowly climbed the academic career ladder, they would turn around to help likeminded people on lower rungs. 1. Whenever Cavalli-Sforza lists his publications he never goes farther back than 1947. His wartime publications are all the more unknown because they were published under the name of Cavalli. He later changed his name to Cavalli-Sforza, having been ostensibly adopted by the second husband of his maternal grandmother. His autobiography dates the name change to 1950 (a year after his father died) when he was 28, married, and already a father. Such circumstances hardly justified adoption under Italian law or custom. Even more inexplicably, he was still publishing under his old name as late as 1953. Google Scholar lists three publications by L.L. Cavalli in 1950, one in 1951, five in 1952, and two in 1953. Berry, J.W., and L.L. Cavalli-Sforza. (1986). Cultural and genetic influences on Inuit art. Report to Social Sciences and Humanities Research Council of Canada, Ottawa. Boyd, R. and P.J. Richerson. (1985). Culture and the Evolutionary Process, Chicago: Chicago University Press. Cavalli-Sforza, L.L. and F. Cavalli-Sforza (2008). La génétique des populations : histoire d'une découverte, Paris: Odile Jacob. (French translation of Perché la scienza : L’aventura di un ricercatore). 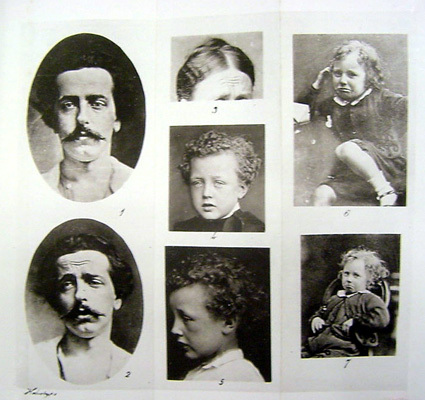 Evolution, Psychology and Psychiatry. (1988). Meeting Announcement, Ann Arbor, Michigan, October 28-30, 1988. HBES. (1990). Summary of the first Human Behavior and Evolution Conference: Evanston, Illinois, August, 1989, Human Behavior and Evolution Society Newsletter, 1(1), 2-4, July 1990. Symons, D. (1989). A critique of Darwinian anthropology, Ethology and Sociobiology, 10, 131-144. Tooby, J. and L. Cosmides. (1989). 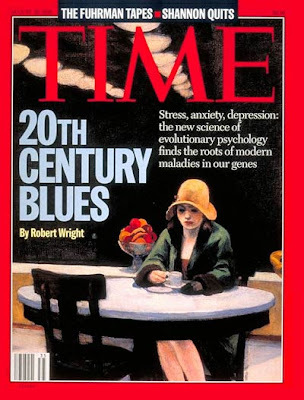 Evolutionary psychology and the generation of culture, Part I. Theoretical considerations, Ethology and Sociobiology, 10, 29-49. 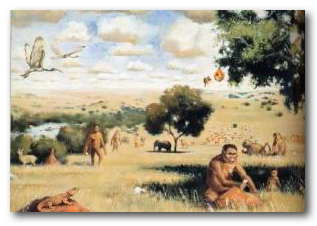 The Environment of Evolutionary Adaptedness, over a million years ago in the Pleistocene. A founding myth of evolutionary psychology. In the future, how will we look at evolution and human behavior? Perhaps we’ll still be looking through the lens of evolutionary psychology, albeit a more “evolved” one than the current variety. Or perhaps there will be a new paradigm. - Human nature is uniform, except for gender differences. It came into existence over a million years ago during the Pleistocene, in the Environment of Evolutionary Adaptedness (EEA). This was long before modern humans began to spread out of Africa some 40,000 years ago and eventually form the populations we know today. - Given the complexity of human behavior, its genetic basis could not have changed to any appreciable extent since the Pleistocene. - All present-day humans are therefore essentially the same. All differences in behavior, personality, and temperament must result from a single human nature responding to different environmental inputs. These assumptions are false. Human genetic evolution has actually accelerated over the past 40,000 years, and even more so over the past 10,000. The latter period, in particular, was not one of people adapting to new physical environments defined by climate, landscape, and vegetation. People were adapting to new cultural environments defined by social structure, normative behavior, and technology. Yes, human behavior is complex, and any genetic influences must be correspondingly complex. But these influences can be radically changed by a few point mutations. There’s no need to start from scratch, as John Tooby and Leda Cosmides imply. There may simply be changes to developmental timing, such as an infant’s mental plasticity being extended into older life stages. Or there may be changes to the degree of masculinization or feminization. The possibilities are endless. Again, there is no need to posit a huge number of genetic changes. Yes, we are adapted to past environments—and not to the present one. And there is often a mismatch between something that made sense in the past and our present reality. But why assume a time gap of over one million years? Is it because the Pleistocene makes an ideal setting for just-so stories? I suspect there is another, more cynical reason. By placing the evolutionary origins of human nature in the distant past, one avoids the messy reality of differences among current human populations—differences in outlook, personality, time orientation, and behavioral predisposition. The Pleistocene EEA may be a just-so story about the past, but it has also had a real impact on the present. It was part of the deal that made evolutionary psychology possible, in the wake of the firestorm that consumed sociobiology. A paradigm can evolve. Medicine was a pseudo-science that killed more patients than it cured as late as the 1920s. In the space of a few decades, the situation completely reversed. There have been similar turnarounds in other fields. Alchemy became chemistry, and astrology became astronomy. Indeed, there have been calls for a rethinking of evolutionary psychology, even from Tooby and Cosmides. “Although the hominid line is thought to have originated on edges of the African savannahs, the EEA is not a particular place or time” (Tooby and Cosmides, 2005, p. 22). It is a composite of whichever selection pressures brought each adaptation into existence. There are thus potentially as many EEAs as there are adaptations, and some may be later than others. Is a paradigm shift in the offing? Probably. But what form will it take? Perhaps the second question is unimportant. Whether evolutionary psychology changes or disappears, we’ll be looking at evolution and human behavior in a very different light. Tooby, J. and L. Cosmides. (2005). Conceptual foundations of evolutionary psychology, in: D. M. Buss (Ed.) The Handbook of Evolutionary Psychology, Hoboken, NJ: Wiley, pp. 5-67. Evolution and human behavior: Towards a new paradigm? This largely German school began in 1937 with the founding of the journal Zeitschrift für Tierpsychologie, mainly through the efforts of Konrad Lorenz. The initial aim was to understand the evolutionary origins of human behavior by identifying human behavioral patterns, by examining how they develop during the life of an individual, and by comparing them to homologous behaviors in other primates and mammals. From the 1960s onward, ethology increasingly shunned the study of human behavior, ostensibly because only nonhuman species could be observed under controlled conditions. Once we had fully understood how and why they behave, it would then be possible to move on to humans. This self-imposed limitation became self-reinforcing: only zoologists went into this field of study, and the occasional musings about human behavior tended to be amateurish. When did ethology cease to mobilize research into human behavior? The cut-off date probably lies shortly after Lorenz’s death in 1989 and the publication of Human Ethology by his student Eibl-Eibesfeldt the same year. Launched in the late 1970s, this North American school drew heavily on the latest developments in evolutionary thinking, which in turn drew on economics and game theory. From the outset, it ran into a firestorm of opposition that doomed any real chances for growth or even survival. - “presentism,” a tendency to see contemporary human behavior as an adaptation to present environments, however recent or novel they might be. - a resulting tendency to see modern behavior as being necessarily adaptive, despite evidence to the contrary. Falling birth rates, for instance, were attributed to parents switching to a K-type reproductive strategy. By the 1990s, few sociobiologists wished to identify themselves as such, if only because the term itself had become an obstacle to public acceptance. In 1997, this field did away with itself. Its leading journal, Ethology and Sociobiology, was renamed Evolution and Human Behavior. This school is likewise North American and largely based in California, its leading pioneers being Leda Cosmides, John Tooby, Don Symons, and David Buss. It took over from sociobiology in the mid-1990s and still dominates thinking on the evolutionary origins of human behavior. Its writers come overwhelmingly from psychology and to a lesser extent from anthropology, biology, and even the humanities. Psychologists are over-represented largely because their discipline better weathered the anti-sociobiology firestorm of the 1980s. 1. The environment of evolutionary adaptedness (EEA). Past environments have shaped human nature. How far back in the past is not clearly stated, although the EEA has typically been equated with the savanna of Pleistocene Africa. 3. Modularity of the human mind. Because specific adaptive problems require specific adaptive solution, the human mind is mainly composed of domain-specific, modular programs. 4. Universal human nature. There is only one human nature. Apparent differences in human nature are simply different outcomes of species-wide programs (as a result of different environmental inputs). The above principles are more than a reaction against sociobiology. They’re an overreaction. Some genetic determinants of human behavior are clearly post-Pleistocene in origin. How are we supposed to explain them? And what about more domain-general aspects of the human mind, like general intelligence? But, then, this “overreaction” isn’t just a matter of rational argument. There is also fear. Leda Cosmides and John Tooby remember the firestorm that ravaged sociobiology in the 1980s. They then wandered a long time in the wilderness before finally landing a permanent academic position. Time and again, they had to convince potential employers or funding agencies that they had no secret interest in psychological differences among human populations. And so was paved the road to evolutionary psychology, a road paved with the best of intentions: legitimate criticisms of sociobiology, with an understandable desire to lead a normal academic life. Ironically, in seeking to challenge this modus vivendi, Cosmides and Tooby have ended up creating a new one. We can now study human behavior from an evolutionary perspective, but only if we exclude (1) psychological differences between human populations and (2) domain-general aspects of human behavior, e.g., general intelligence. That’s the implicit deal behind evolutionary psychology—an acquiescence to self-censorship. How has the deal worked out? Quite well, apparently. Evolutionary psychology has attained a degree of respectability that seemed impossible back in the mid-1990s. In 1995, only 261 newly published academic books or articles mentioned the term “evolutionary psychology.” Last year, the figure was 3,570 (see Google Scholar). This field now has its own handsomely illustrated textbooks, grad school programs, and research centers. Perhaps more importantly, it now incurs few costs to a career in academia. But maybe this would have happened anyway. By the mid-1990s, the anti-sociobiology firestorm was burning itself out. The far left had entered a steep decline, and its graying leadership was pushing sixty. With rising tuition, a weakening economy, and aging demographics, the social sciences were attracting fewer and better students. Meanwhile, the advent of the Internet was “deregulating” the marketplace of ideas. Has self-censorship calmed debate over evolution and human behavior? I’m not so sure. In any case, it has certainly done much to distort the way the debate is framed. And this is the sad part. Evolutionary psychologists often produce interesting findings, only to fall down when they try to interpret them. For instance, it is known that children develop differently if the biological father is absent and a strange male is present (e.g., a stepfather). In both sexes, sexual activity will begin earlier with less stable pair bonds. Sons will show hypermasculine behavior, such as aggressive acting out, boasting, and risk-taking. Daughters will reach puberty earlier and judge potential mates by current appearance and status in the male hierarchy rather than by steadfastness and ability to support a family. It has thus been hypothesized that an early sensitive period allows certain environmental cues, like father presence, to define reproductive strategy later in life (Ellis et al., 2003). The above reasoning is consistent with the four principles of evolutionary psychology. It’s also false. A recent twin study has found that early menarche is predicted as strongly by a step-uncle’s presence as by a stepfather’s. “It does not seem necessary for a child to experience the direct environmental influence of a stepfather to exhibit an accelerated age of menarche—as long as she is genetically related to someone who does have a stepfather” (Mendle et al., 2006). In other words, a woman may be more prone than others to early menarche, a high degree of female reproductive autonomy, and low expectations of paternal investment. It’s not as if she acquires this reproductive strategy from her childhood environment. Instead, she inherits it genetically from her mother and absent father. So where do we go from here? We can continue down the road paved by Cosmides and Tooby. But it will often take us to a dead end. We’ll then have to waive some or all of the above four principles, assuming of course we wish to understand human behavior. Ellis, B.J., J.E. Bates, K.A. Dodge, D.M. Fergusson, L.J. Horwood, G.S. Pettit, L. Woodward. (2003). Does father absence place daughters at special risk for early sexual activity and teenage pregnancy? Child Development, 74, 801-821. Mendle, J., E. Turkheimer, B.M. D’Onofrio, S.K. Lynch, R.E. Emery, W.S. Slutske, and N.G. Martin. (2006). Family structure and age at menarche: a children-of-twins approach, Developmental Psychology, 42, 533-542. 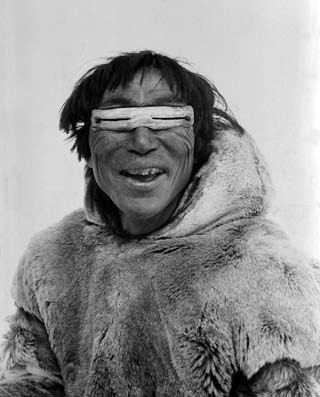 An Inuk wearing snow goggles. Is ambient light at its lowest in Inuit territory? The logjam seems to have broken. On the heels of Lewis et al. (2011), we now have another paper on variation in brain size among human populations, this time by Pearce and Dunbar (2011). Brains vary in size by latitude, being bigger at higher latitudes and smaller at lower ones. This variation seems to reflect an adaptation to climate. But just how, exactly, does climate relate to brain size? How direct or indirect is the relationship? How credible is this explanation? First of all, visual cortex size was not directly measured. The authors inferred that this brain area was responsible for the increase in total cranial capacity. Obviously, they couldn’t have done otherwise. They were measuring skulls, not intact brains. But there’s another problem—one in the realm of logic. A lot of things correlate with latitude: pigmentation, mating systems, rules of descent, degree of paternal investment, and so on. If one of them correlates more strongly with latitude than the others, does it therefore cause the others? Not at all. It may be closer than the others to this shared cause, but it doesn’t necessarily lie on the same causal chain as the others. In other words, the level of ambient light does not produce a single cascade of consequences, with eyeball size being the first consequence. There are probably many different cascades. To date, the best map of human variation in brain size is the one by Beals et al. (1984) (see previous post). If dimness of light is the main determinant, brain size should be highest in northwestern Europe, northern British Columbia, the Alaskan panhandle, and western Greenland. These regions combine high latitudes with generally overcast skies. Yet they are not the regions where humans have the biggest brains. Instead, brain size is at its highest among humans from the northern fringe of Arctic Asia and from northeastern Arctic Canada. These regions are, if anything, less overcast than average. They often have high levels of ambient light because of reflection from snow and ice. The jury is still out on this question. I suspect, however, that the following three factors probably explain variation in brain size with latitude. 1. Among hunter-gatherers, hunting distance increases with latitude because there are fewer game animals per square kilometer (Hoffecker, 2002, pp. 8-9). Hunters must therefore store larger amounts of spatiotemporal information (landmarks, previous hunting itineraries, mental simulations of possible movements by game animals over space and time). This factor might explain why brains have grown smaller since the advent of agriculture. 2. The seasonal cycle matters more at higher latitudes. As a result, northern hunter-gatherers, and northern agriculturalists even more so, must plan ahead for the next season (or even for the season after the next one). 3. Women gather less food at higher latitudes and almost none in the Arctic. They are thus free to specialize in other tasks, such as garment making, food processing, and shelter building. This “family workshop” creates opportunities for greater technological complexity, which in turn increases selection for greater cognitive performance. I suspect bigger brains provide not so much greater intelligence as greater ability to store information. As such, they nonetheless pre-adapted northern hunter-gatherers for later advances in cultural evolution.